Early morning, on Wednesday, July 12, 2017, Southeastern Wisconsin residents woke to rain waters filling their homes. A few days later, Mother Nature struck again; creating flash floods in the Southwestern part of the state, leaving residents and communities devastated with the worst flooding in Wisconsin since 2008. Governor Scott Walker declared a state of emergencies for all 17 counties within a week. With neighbors looking to begin the clean-up and recovery process, the American Red Cross came in full-force to assist in the efforts. In all, 10 shelters were opened and neighbors were invited to use the Red Cross facilities to shower, eat a meal, stay overnight, receive minor medical attention and, most of all, a compassionate shoulder to lean on was available 24/7. To assist individuals in getting on their feet, more than 2,000 flood victims were provided with clean-ups kits filled with necessary items, such as mops, gloves, bleach, all-purpose cleaners, and masks, to begin the clean-up process. The Red Cross also provided more than 5,500 people with essential bulk items like bottled (canned) water; courtesy of Miller Coors, bug spray donated by SC Johnson, and even a warehouse and forklift from Kwik Trip provided a receiving location for the many trucks arriving from the St. Louis warehouse. The Red Cross also coordinated with community partners such as the Salvation Army, Samaritan’s Purse, WE Energies, Aurora Health Care, and state health services by opening three Multi-Agency Resource Centers (MARC). The Red Cross MARC’s provided flood victims with a ‘one-stop shop’ to meet with partnering agencies to secure assistance for their long-term recovery. For an elderly woman, fighting leukemia, Colleen Manderfeld’s nightmare was true as her sump pump failed and her hobby room was full of murky water. Colleen and her two sons began the cleaning process but were soon over-whelmed. Having seen the Red Cross on television she attended the MARC and asked about what assistance may be available. The Red Cross is driven by local volunteers who give of their time, talent and treasure to ensure each disaster victim is supported. Early evening on May 16, 2017, a deadly tornado cycle took aim on Barron and Rusk counties in northern Wisconsin. The EF-3 twister with winds of at least 140 miles per hour ran for 83 miles which makes it Wisconsin’s longest tornado since modern documentation began in 1950. The storm damaged 231 homes and four commercial buildings. The storms epicenter was the Prairie Lakes Estates mobile home in Chetek and the Jennie-O turkey farm were tossed, turned, stripped and shattered to pieces. Leaving 40 homes destroyed, one person dead and 35 injured. Across county lines, in Rusk County, Conrath was hit the second hardest from the same tornado. The American Red Cross quickly set up two reception centers at Mosaic Telecom in Cameron, the Ladysmith Sheriff’s Department first and then the Holy Trinity Church in downtown Conrath. Red Cross Disaster Responders from all over Wisconsin rushed in to support the shelter conduct damage assessment, work one-on-one with clients including by providing financial support, replacing medications and equipment to providing an emotional support to those left temporarily homeless. For the Rutledge family, the trauma of the storm was multi-faceted. The family huddled in their mobile home before it broke apart and thrown across the earth. One member of the family was transported to Regis Hospital with life-threatening injuries. While looking at the remains of their home, they heard noises. Garnering the attention of first responders, they lifted twisted metal, shattered wood and through insulation carefully, quickly – yet carefully – through the remains. When their bunny “Racer” was in the arms of the family, they knew not all was lost. See American Red Cross Wisconsin Chapters Flickr site for more photos. Our largest Multi-agency Resource Center, often called a “one-stop shop” for residents, was spearheaded by the Red Cross. For two days, Mosaic Telecom hosted 26 agencies. These agencies provided assistance ranging from; rent assistance, security deposits, furniture, household supplies, food, clothing and much more. Each attendee started with the Red Cross caseworkers to help people create personal recovery plans, navigate paperwork, and locate assistance for their specific disaster-caused needs. The Red Cross has also trucked in rakes, gloves, masks, googles, bug spray and plastic bags to help in the clean-up process. For Polk County resident, Sue Ames-Lillie, this was the first MARC she has been to, even though she has responded to hundreds of residential fires. She recalls one mother and child in particular. “The mother was battling stage-4 cancer and yet she still had the strength to carry her son upon arrival. After striking a conversation, I learned he had lost his favorite toy.” Sue ushered them in for lunch, then offered clothing along with other items provided by multiple resources. “Permission was granted to take him to a special area where toys and stuffed animals were waiting for children. His frown turned to a smile and this is how I will forever remember this day” Sue shares with gleaming eyes. Moving forward the Red Cross is a partner in the Barron County long-term recovery process to ensure community resiliency is achieved. Our community education team will also be available to area schools and groups to share emergency preparedness information such as The Pillowcase Project for grade school kids. Overall, the Barron County Sherriff’s Department estimates about $10 million in damages. The Rusk County Sheriff said their area sustained heavy damage to public and private properties, including homes and rural farms. The United States as a whole is in the midst of one of the worst, and most expensive, wildfire seasons on record. To-date this year, more than 8.5 million acres have burned. In addition to the wildfires currently devastating California, Red Cross disaster workers are assisting with relief efforts for an additional 26 large-scale active wildfires that are currently burning across Idaho, Oregon, Texas, Utah, Washington and Wyoming. So far this wildfire season, Red Cross teams across multiple states have operated 52 shelters that saw over 2,400 overnight stays, served nearly 41,000 meals and snacks and distributed nearly 5,000 relief supplies to assist those impacted by raging wildfires. The Red Cross is also working with partners to provide care for evacuated pets and animals. When disasters hit, the impact is felt far and wide – property is damaged, people are displaced, and lives are upended. But one of the greatest impacts of a disaster is often unseen: the effect on people’s emotional health and mental well-being. Trained Red Cross caseworkers are providing much needed mental health services for individuals and families impacted by these disasters, helping people deal with the intensity of the disaster and connect with additional resources within their community. And as fires continue to burn, Red Cross disaster workers are also looking ahead to coordinate recovery efforts for both individuals and families impacted and displaced by these devastating fires. 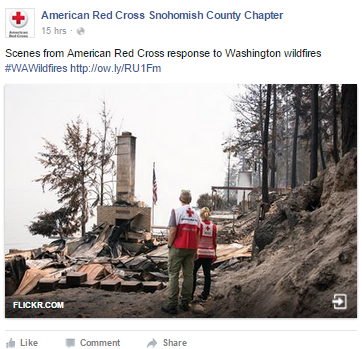 The Red Cross will continue to work within communities to provide the needed resources to help people respond and recover from wildfires – even after the smoke clears. People in the path wildfires, hurricanes and other severe weather should download the Red Cross Emergency App for real time access to weather alerts, preparedness information, safety tips and shelter locations. The Emergency App provides expert advice on what to do during floods, tornadoes, wildfires and other disasters. The app also provides lifesaving information on emergency first aid for various situations such as what to do for heart attacks, heat-related emergencies and includes water safety tips. Pre-loaded content ensures that guidance from Red Cross experts is available anytime, anywhere – even without mobile connectivity. The Emergency App is available for free in app stores for smartphones and tablets and can also be found by searching for American Red Cross or by going to redcross.org/apps. If a wildfire threatens, be ready to leave at a moment’s notice. Confine pets to one room or spot so that you can find them if you need to evacuate quickly. When smoke levels are high, do not use anything that burns and adds to indoor air pollution, such as candles, fireplaces and gas stoves. Click here for additional safety information, including what do to before, during and after a wildfire. 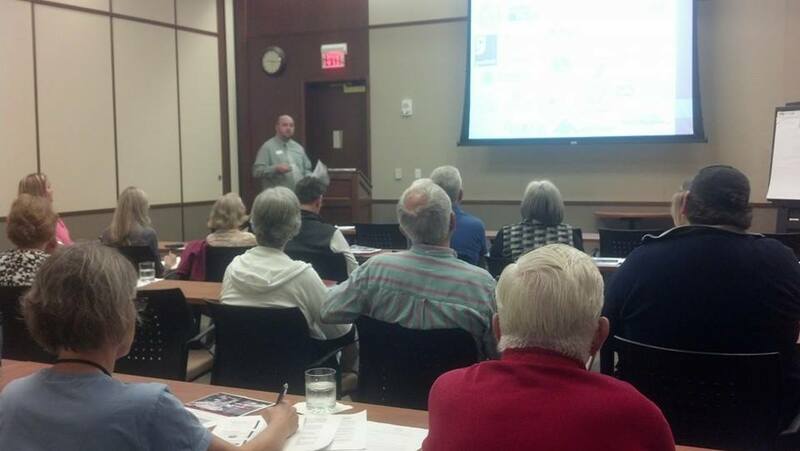 Nick Cluppert, Disaster Program Manager, presenting to volunteers and community partners in West Bend. Multi-Agency Resource Centers (MARCs) are a newer concept that can be used following a disaster to provide services to clients. MARCs are locations that are set up where different organizations come together under one roof to provide services to those affected by the disaster. The MARCs allows clients to come to one place to receive services, and prevents that client from having to go to multiple places to receive services to help with their recovery efforts. The Red Cross has been doing a number of informational sessions on MARCs that volunteers and community partners have been invited to attend to learn more information. Three separate sessions were held in West Bend, Neenah and Fond du Lac in September and October. Between the three sessions 81 volunteers and community partners attended to learn more about MARCs and how they can benefit the community and individuals following a disaster. By holding these informational sessions we were able to educate our partners on what MARCs are, so when a disaster happens they will already be familiar with the concept. New partnerships and agreements are being formed because of these sessions. It is exciting to see the collaboration that had developed between agencies by bringing people together with a common goal – helping disaster clients with their recovery. We will continue to work with the partners that have come to these sessions, as well as those that did not come to continue to develop plans and procedures on how we will bring a MARC together following a disaster. The American Red Cross has received widespread support after Superstorm Sandy, and along with those contributions have come questions—including in stories that have run on The Daily Beast—about how those donations are being put to use, and what we’re going to do with the remaining funds. These are legitimate questions, and the Red Cross is committed to transparency and welcomes this opportunity to answer them. In my more than four-and-a-half years at the Red Cross, I’ve been no stranger to disasters, whether tornadoes, floods, earthquakes, or hurricanes. But what struck me was the massiveness of Sandy’s fury, the miles and miles of devastation that just seemed endless. The destruction wrought by Sandy also had a personal element for me: I grew up and spent most of my life in the New York/New Jersey area, and my heart goes out to all those affected by the storm. While I have been to the impacted areas several times since Sandy hit, I will never get used to looking into the eyes of someone who lost everything. At the same time, I am also struck by the determination of these individuals to start over, rebuild, and power through their loss. So how exactly are we helping them? While the American Red Cross is a grassroots network of local chapters and volunteers, the sheer size of Sandy required us to bring people and resources from all over the country to help our chapters in New York and New Jersey. Over the past seven weeks, we have mobilized more than 15,800 trained workers, 90 percent of whom are volunteers. We have also worked closely with other nonprofit and government partners, because a disaster this size is too big for any one organization to handle. • Served more than 8.9 million meals and snacks. • Handed out more than 6.7 million relief items such as cold-weather items and clean-up supplies. • Provided more than 103,000 health services and emotional-support contacts for people living in very tough conditions. • Supplied more than 81,000 shelter stays, more than half of the total number of Sandy shelter stays (158,000) provided by a range of groups. And we still have much more work to do. Of the $202 million in donations and pledges we have received to date, we believe that approximately $110 million of that will be spent on our emergency-relief operations by the end of December. Remaining Sandy-related donations will be used by the Red Cross to meet longer-term needs—what we call “recovery”—of people affected by this disaster. Our initial recovery efforts are expected to cost at least $60 million; any remaining funds will be allocated to additional long-term efforts. We have developed a recovery plan by working closely with other nonprofits and government agencies—including FEMA—to coordinate efforts and identify unmet needs. While I have been to the impacted areas several times since Sandy hit, I will never get used to looking into the eyes of someone who lost everything. • People with demonstrated needs that exceed what can be met by insurance, FEMA, and state resources. This means that part of our efforts over the next several months will involve one-on-one work helping those who have trouble finding assistance on their own. These are the types of activities a survivor doesn’t want to go through alone, and we can provide the expertise, as well as a shoulder to lean on during the process. That includes helping people fill out insurance paperwork, identify child-care resources, find new housing, and connect with social services in their communities. In addition, we also will be supporting projects and programs of other nonprofit groups in the New York and New Jersey area, such as working with several local food banks to help Sandy survivors have access to food during the new year. Editor’s note: On July 21 and 22, American Red Cross CEO Gail McGovern traveled to Port-au-Prince, her fifth visit to Haiti since last year’s devastating earthquake. Here are some observations from the trip. Every time I make a trip to Haiti, it looks a little bit better. On this visit, I’ve sensed a real feeling of optimism. There’s a returning sense of normalcy, less rubble, and signs of rebuilding. I also saw fewer people in the camps, and the numbers bear it out. People are moving from under tarps, into homes and getting on with their lives. What the American Red Cross is doing in Haiti is very much in the spirit of building back better. On Friday I attended a meeting of the Interim Haiti Recovery Commission. President Martelly was at that meeting, and shared with us the details of his 100-day plan. Among other things, it focuses on systematic ways to move people out of six camps and into neighborhoods. The plan seems reasonable and feasible, and I was certainly impressed with the presentation. The American Red Cross and our partners in the Red Cross network have decided to allocate funds to relocate about 900 families from one of the makeshift camps, as part of the 100-day plan. We’ll do this through a combination of new home construction, repair of damaged homes and economic support to renters. What the American Red Cross is doing in Haiti is very much in the spirit of building back better. The global Red Cross network has also committed to helping 30,000 families transition out of camps and into safer homes. That work is well underway, and more than 12,000 families have been helped. Semi-permanent houses are going up and there are smiles on the faces of recipients. It’s a beautiful thing to see. The next step in our housing strategy is more ambitious. We’re planning on repairing and potentially building permanent homes. In fact, one of our stops on this trip was at a housing exposition in Port-au-Prince. President Martelly and Bill Clinton – who’s co-chair of the recovery commission – attended the expo as well. About 60 different construction companies were there showing their designs. We’re putting together a request for proposals to evaluate which options are best for us. Building permanent communities will be harder, and will take longer. It will involve not just the homes themselves, but a whole series of interconnected services, from water and sanitation to roads. We’re talking about a massive urban renewal program that’s going to take years to complete. Our hope to create sustainable change in Haiti. When I look at the Haitians, I see people who are hopeful, optimistic and resilient. They’re industrious and entrepreneurial. But Haiti is a challenging place too. It’s going to be complex to get all this done in an equitable way. Despite the challenges, I truly do have a feeling of optimism.